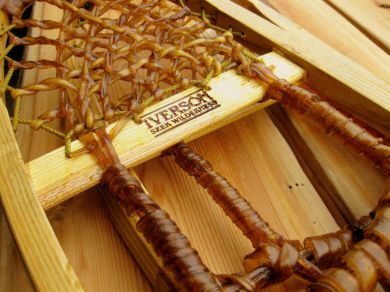 Iverson Traditional Handcrafted Snowshoes made in Michigan Upper Peninsula for Decades. 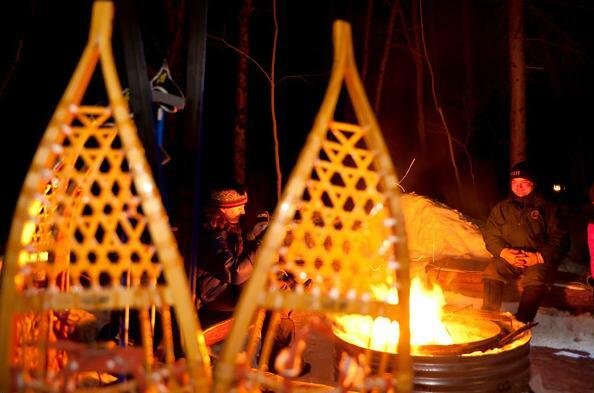 Iverson Snowshoes are Hand crafted in Michigan's Upper Peninsula. Warranted for 5 years. Made with only select northern white ash frames. All Iverson Snowshoes are available with either traditional rawhide lacing or the new neoprene lacing that is 30% lighter. Iverson Snowshoes make great decorations in the off season and treasured as pass downs to future generations of outdoor enthusiast. Click the pictures above to watch our videos! This is a modified version of the Standard"A". This style has a reinforced toe buckle for a snugger toe fit. We also added more material for a firmer grip around the foot. This is a one size fits all. The snowshoe used by arctic adventurers for their wilderness expeditions. Made for moving over long distances in deep powder and drifted snow. The shoe used by arctic adventurers for their wilderness expeditions. We just made our Deep Snow Snowshoe even better! This winter if you buy the 13 x 35 Modified Bear Paw Neoprene Snowshoe we are throwing on the matching "AA" Leather Harness for Free! Our Westover modified design is for those who love deep snow. We just made our Deep Snow Snowshoe even better! This winter if you buy the 13 x 35 Modified Bear Paw Neoprene Snowshoe we are throwing on the matching EZ Leather Harness for Free! Our Westover modified design is for those who love deep snow. A versatile snowshoe that tracks very well, even in the deepest drift conditions. Used by many long distance trekkers' and winter campers. Our best selling snowshoe. Perfect for the recreational user. A great survival snowshoe too. Excellent maneuverability in brush and wooded terrain. The Iverson “AA” all leather version has the EZ-OFFS back making this harness one of the simplest yet! The EZ-OFF back is designed with 3/4 bungee strapping that makes for very easy adjustments. A nimble shoe that's popular with hunters and trappers. Excellent for breaking trails in moderately wooded and open terrain. The Michigan 12 x 46 Rawhide Snowshoe Package W/ Leather "AA" Harness is a winner. Excellent for breaking trails in moderately wooded and open terrain. Built Iverson tough with traditional rawhide lacing. Iverson Snowshoes are Warranted for 5 years. Modified Bear Paw for those that love deep snow. Iverson Modified "H" Snowshoe Harness. Made leather. Will not stretch or ice up. Adjusts to any boot or shoe. Iverson's version of the ancient snowshoe design is now more popular than ever. Iverson's version of the ancient design is now more popular than ever.